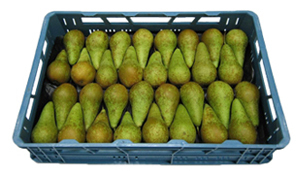 Pears are packed in different displays. 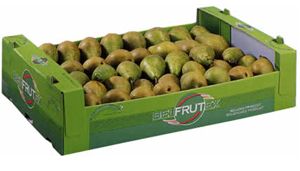 • Ifcoboxes and Belfrutex cartons of 13 kg. • Loose packed fruits are available. • Foodtainers and Plasticbags can be ordered. 80% of the country’s production. A long slender juicy pear in a greenish-brown coat. Available from September to June. Very fine green dessert pear (queen of pears). Large-sized fruit - excellent taste and extremely juicy. Available - September until January. A brown juicy pear with a special taste. Autumn pear - period September-November.